The East Bathurst spur began at the New Brunswick East Coast mainline outside Bathurst (mile 108.3), and travelled 4.3 miles to its termination in East Bathurst. The spur was a remnant of the old Caraquet Subdivision, formerly owned by Canadian National. 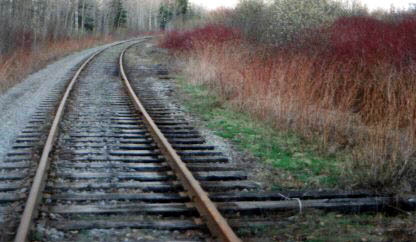 The line was originally built as the Caraquet Railway and stretched from Gloucester Junction on the Intercolonial to Shippigan. 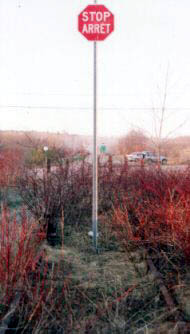 The spur served the Bathurst Industrial Park until its termination in 2003. Almost all of the track was 85 lb rail dating back as far as 1920, although there were a few 100 lb rails with the appropriate adapters. Most of the rail is labeled similar to “CANADA-ALCOMA-85 LBS SLT-13-OH-1920”. Much of the rail was quite rusty. The spur begans at Gloucester Junction, just south of Nepisiguit Junction, and crossed provincial highway #11 at around mile 2.0. In 2003 this crossing was removed and paved over. Shortly thereafter, it described an S curve through some fields. An old roadbed was visible to the right at about mile 3.0, curving out into the Bathurst industrial park. At about mile 3.3, another old roadbed was visible to the right. The ties for the old switch were still in place. 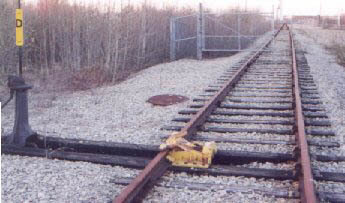 The first switch off the spur curved off to the right and terminated in an area enclosed by mesh fencing (1 car spot within the fencing). The ballast appeared to be nearly new, although the rails are quite old. A local resident told me that a businessman attempted to build a scrap yard there a few years ago, and met with strong local opposition. The area is zoned “light industrial” and his request to rezone it for “heavy industrial” was not successful. This switch was protected by a derail. 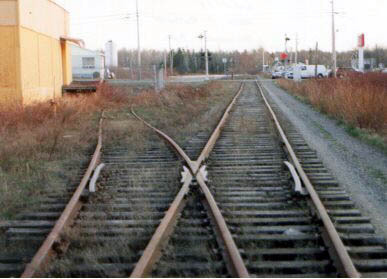 The next switch was to the right, to the local Irving Oil Limited fuel depot. There were five tanks there and four car spots. Viewed from the other side, the tanks were lettered I R V I N G.
The Irving Oil Limited fuel depot has been removed. At last visit the tanks were lying on their side. Immediately following that switch was a small siding holding perhaps five cars. The frog for the switch going into the siding has been removed, effectively making the siding single-ended. 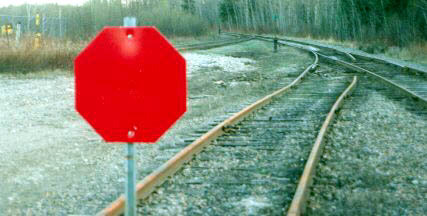 A stop sign has been placed in the siding to warn of the missing track. Parallel to the spur on the left was what appears to be old roadbed that curves off toward the center of Bathurst. There was an old placemarker sign reading “CN East Bathurst” with the CN partially painted out. 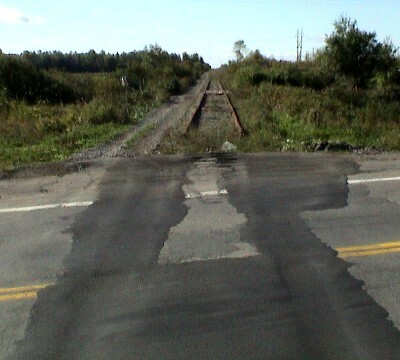 The spur trackage continued on to cross Miramichi Avenue, a four-lane road leading into Bathurst. The crossing was protected by flashing lights. Across the road, the spur continued for another few hundred feet before it terminated at mile 4.3. A trailing-point switch led to an abandoned warehouse, with a loading dock and a spot for a car within mesh fencing. The warehouse appears to be in disuse, and the rail section had clearly not been used for some time. According to a CN timetable from 1973, this was the Ottawa Valley Lumber Company. The switch number was BK13.